One of the very first things people need to consider when planning a space for optimum sound is acoustic treatment, whether it’s for watching movies, listening to music, or recording. A useful acoustical treatment material, sound deadening foam is one of the products people rely on for fixing flutter echoes, standing waves, and mid to high-frequency problems. But given the similarities between the different varieties found in the world of foam, many people wonder, “What’s the big difference between sound foam and the stuff in my couches or pillows?” At The Foam Factory, we think this is a smart question. Featuring a product line that reaches from memory foam mattresses, pillows, and camping pads, to packaging solutions and sound deadening materials, The Foam Factory is more than qualified to provide a clear distinction. 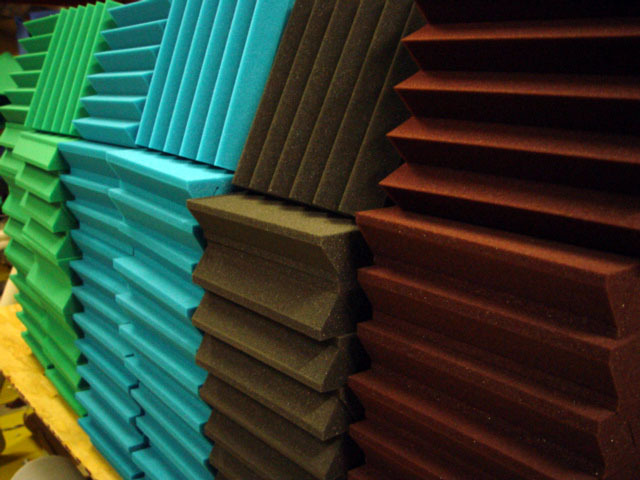 In general, acoustical foam looks and feels very similar to other foam materials. However, acoustical foam is also specially engineered to have unique traits that differentiate it from the everyday foam in your couch or mattress. What follows is a look at some of the main differences between conventional and acoustical foam, which should help you see why “very similar” isn’t good enough when it comes to sound treatment. For more information on fire retardant foam and The Foam Factory’s Class A rating, view our Technical Specs and our article on the ASTM E84 standard. Durability – Since acoustical treatment is going to be in close contact with people, it’s bound to fall victim to the occasional accident. This can range from brushing against mounted foam wedge tiles to dropping something heavy on a corner bass trap. For obvious reasons, the foam must be durable as well. Acoustical foam is made to be “non-dusting” so it resists crumbling and wearing away, as the phrasing suggests. If used within a casing like a couch cushion, this wouldn’t be an issue, but in the open and exposed, it can be a problem. In studios where people can quickly fill a tiny space, or an entertainment room full of guests, foam can be bumped, brushed, poked, and scratched. The Foam Factory’s acoustic foam is made to stand up to this kind of accidental abuse longer than conventional foam would, if used in the same way. Firmness – Firmness, or Indentation Load Deflection (ILD), is an important characteristic for people selecting foam packaging or couch cushions, but it matters in sound foam as well. Acoustical foam is formulated to a firmness that offers the best absorption across all frequencies, as a higher ILD (firmer foam) absorbs more low-frequency sound, and a lower ILD (softer foam) absorbs more high-frequency sound. In a product like The Foam Factory’s 3” pyramid tiles, a balance between the two must be met to span the widest spectrum of performance. Using non-acoustical foam with vague firmness values can leave frequency voids or be too reflective. Cellular Structure – A distinct difference between acoustical foam treatment and conventional foam is also present in the physical structure of the materials. Foam is made of millions of tiny cells, and the size of those cells has a meaningful impact on performance, no matter the application. Pores Per Inch rating (PPI) is one way foam’s physical makeup is measured, and it means exactly what it sounds like: the number of individual cells in one linear inch of foam. 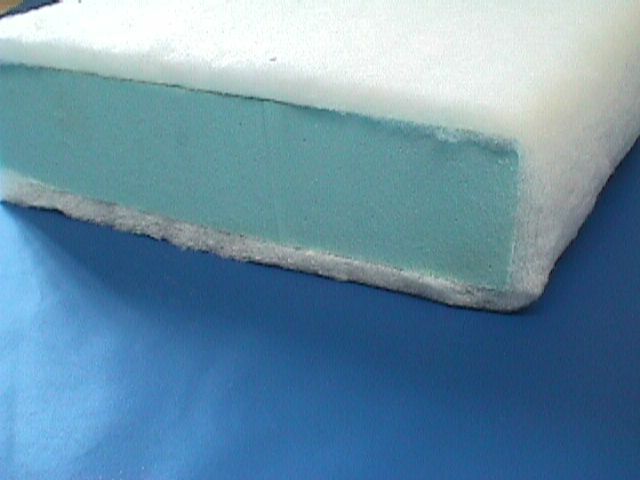 Cushion foam usually has a PPI of 60-70 cells and porous foam made for special applications like outdoor cushions can have ratings low as 25 or 30 PPI. Quality sound foam possesses a PPI around 80. Higher PPI means more cells, which equates to a more sonically-absorbent product. Take this striking example of what a difference a seemingly minor change in PPI can make: a 12” x 12” x 3” tile of 80 PPI foam would have more than 127 million additional cells compared to a 60 PPI foam with the same dimensions. Appearance – While it may sound superficial, the appearance and design of acoustical foam is yet another factor that differentiates it from conventional materials. Minor blemishes on a couch cushion will have zero performance impact and will be masked by the cover. The same blemish would be an aesthetic issue in acoustical panels mounted in a professional studio, however. Because sound spaces are frequently evolving, more materials may be needed down the road. Visual consistency is also important, because if you buy the same product months apart, the old and new need to look identical. The Foam Factory’s designer patterns such as waves and grids also have an impact on the way sound waves are treated, when compared to a plain sheet foam. 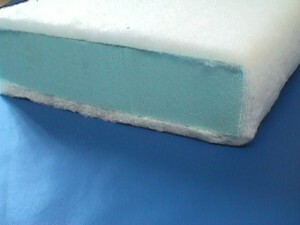 On a surface level, it may seem that all foam is the same. In reality, the different types of foam are like apples and oranges; both are fruit but they have different flavors. So if you’re in need of sound treatment, make sure not to pick a bad apple. *Many areas have regulations involving the use of flame retardant materials, particularly in commercial situations, so check your local codes before beginning a project. Bass Traps / Bass Absorbers. Solid sheets of acoustic foam. If I need acoustic foam in a dining space and want to keep the ambience… Can I wrap the foam in fabric? I need a Victorian look. Yes, the foam can be wrapped in acoustic cloth for your application. Do you have any particular recommendation for use in a vehicle where tyre noise is an issue? I have already applied dampener and isolator which has made an improvement, but I notice a further improvement if I push two pillows onto the rear parcel shelf (which blocks the whole area including the rear window so not a practical solution), so I am thinking of applying sound absorber to the rear of the back seats and also to lay onto the parcel shelf which will hopefully help to take out some of the drone. We would suggest our neoprene foam for your application, at least 1/2″ thick. Can i use low density sofa foam as acoustic panels ? Please suggest me a low budget material for acoustics for my sound studio. For economical foam, we would suggest our acoustical eggcrate foam for your application. What is the best material to use against noise from high frequency electronics? If you are trying to block sound, I would suggest our Neoprene-Regular foam, 1/4″ or 1/2″ thick. What foam do you suggest to block out freeway noise at night for an apartment window? I would suggest our Neoprene-HQ foam, at least 1″ thick.